You may be familiar with Indy Stair Lifts’ models for straight and curved staircases, and we’re also proud to offer exterior stair lifts for outdoor use that accommodate difficult to climb porch stairs. The Indy Outdoor Stair Lift mobilizes your porch stairs and provides mobility in all kinds of weather. A weather-resistant design makes usage in all conditions possible. 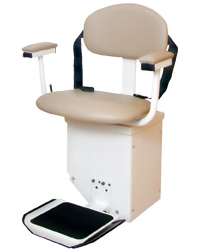 Our exterior stair lift comes with a swivel seat and sensors and has a weight capacity of 350 pounds and a 19″ wide side to accommodate all body types. It’s protected from the elements by weather-tight header and seat covers. It travels 16 feet at a speed of 20 feet per minute. The Indy Outdoor Lift also comes with safety features, including safety sensors that stop the lift to avoid stalls if it meets an obstruction. Indy Stair Lifts is the industry leader with its 10 year warranty on all stair lift models, including the exterior stair lift. We also offer 24/7 phone support at 888-203-5754. Call us anytime with questions about your exterior stair lift and enjoy prompt support from our professional staff. If you call us today, we’ll provide information about our complete line of professional stair lifts, from inside models for straight and curved staircases to the exterior stair lift that enables you to ascend porch stair easily. Contact us at your earliest convenience for more information about our line of professionally designed and installed stair lift models, including the exterior stair lift that offers outdoor mobility on your porch stairs. We’ll also provide information on veteran’s discounts, used stair lift sales, stair rentals, and our industry leading buy back guarantee that protects you from stair lifts that no longer suit your needs.